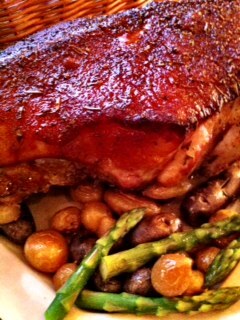 This cut of pork is wonderful. 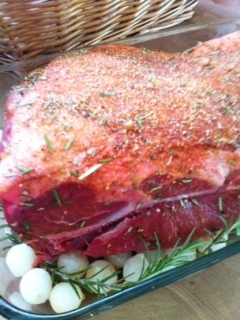 The meat is a bit darker and fattier than a loin roast, therefore it takes well to slow long cooking. I keep the rub fairly simple because when you have a piece of meat this large, you will be using it as a base to many meals – with potatoes and asparagus (and my beloved cranberry jelly) the first night, Mexican the next night, Chinese another night, then barbecue sandwiches from then on. I think I paid 9 dollars for it – go ahead and splurge on the wine.. This entry was posted in Recipes and tagged barbeque sauce, Frozen Pearl Onions, pork, slow cooked pork, smoked Spanish paprika. Bookmark the permalink.